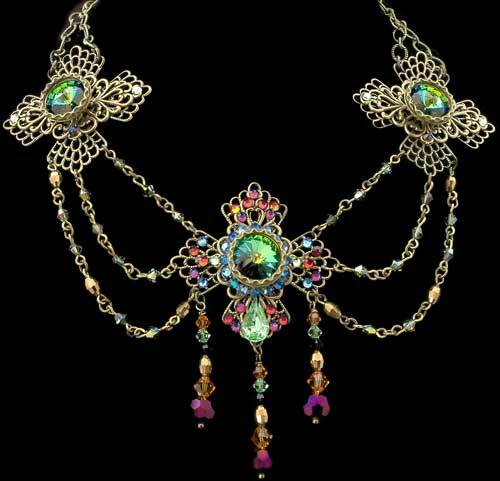 This magnificent one-of-a-kind Victorian styled necklace is adorned with multitudes of tiny Swarovski crystals. The three separate center stones resting on antiqued gold brass filigrees are called Rivoli’s and their gorgeous color is called Vitrail. Swarovski Rivoli Vitrail crystals reflect exquisite hues of golds, greens, blues, purples and magenta much like a rainbow effect. My color palette of Swarovski crystal beads were all chosen to accent this incredibly brilliant colored crystal. © Judy Sachs. All rights reserved.